WSU's Tennis Club is a student run organization dedicated to giving students of all skill levels and abilities the opportunity to play tennis both competitively and just for fun. 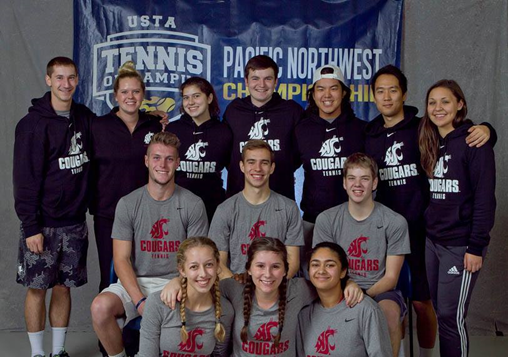 Our practices are devoted to developing core tennis skills, and making connections with fellow Cougs! Our club consists of 40+ recreational members, and two competitive teams! Our competitive teams travels all around the United States playing USTA Tennis On Campus tournaments. We meet Mondays and Wednesdays from 7pm to 10pm inside the Hollingberry Field house! Come check us out! GO COUGS! And find us on Facebook at WSU Tennis Club! Ask to join and for approval. This is how we like to communicate with all club members.